Why have Marxists ever bothered with the Labour Party? 8. Trotsky: "It is impossible to leap over the problem. It must be solved"
7. AWL and the imaginary "pole"
5. Does disgust with New Labour rule out revival? 4. Instead, build an alternative "pole" by way of disaffiliations? 3. Why argue now for a union fight in the Labour structures? The reciprocal relation between boom and crisis in economy and the development of revolution is of great interest to us not only from the point of theory but above all practically. Many of you will recall that Marx and Engels wrote in 1851 – when the boom was at its peak – that it was necessary at that time to recognize that the Revolution of 1848 had terminated, or, at any rate, had been interrupted until the next crisis. Engels wrote that while the crisis of 1847 was the mother of revolution, the boom of 1849-51 was the mother of triumphant counter-revolution. This is an excerpt from the founding document of the AWL tendency, "What We Are And What We Must Become", written in 1966 by Rachel Lever, Sean Matgamna, and Phil Semp. The authors were all then members of the RSL, the group later to become known as the Militant and today continued by the Socialist Party and Socialist Appeal. They wrote the document as a critique of the RSL's politics, which were then centred around a "perspective" for the evolution of the Labour Party into (eventually) a mass socialist movement led by "the Marxists". 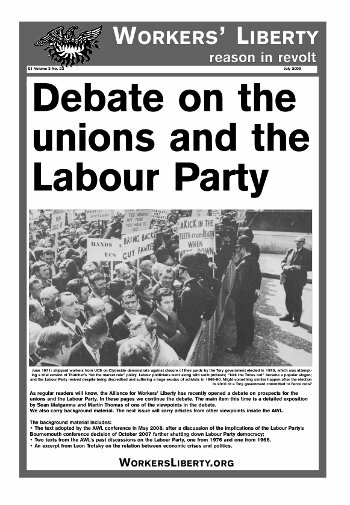 This discussion article on Marxists and the Labour Party was written by Sean Matgamna in September 1976, at the end of a big political battle in the International-Communist League, forerunner of the AWL, in which attitudes to the Labour Party figured as one of the issues. Of course nothing in it can be applied directly to a very different situation 33 years later. Its value here is that it discusses Marxist tactics towards the Labour Party over a long space of time and in a variety of circumstances. Historical references can never settle a question; but we can learn from history, for example from how Trotsky responded in previous circumstances when it was argued that social democratic parties had become so dead that the sheer weight of political disengagement and unresponsive leadership ruled out revival. One of the dangers AWL faces - and into which some on the other side of this dispute have fallen - is that we conflate things that should be kept distinct. (b) We want to promote the working class and the bedrock broad labour movement, the trade unions, to develop political independence. Apart from a small few people AWL is agreed that in a general election we will say: "Vote Labour as fallback where there is no acceptable socialist candidate". Why? The Democrats in the USA are the choice of most unions. Despite that, we do not advocate a Democratic vote, and we do advocate a Labour vote. Why? Because in a limited sense New Labour, even as it is, and not forgetting or discounting any of the shifts of the last 15 years, remains the trade unions' party. Our procedure is based on the idea that Marxists develop and redevelop their expectations of what will or can happen within the frame of the big shaping objective events. When the economic, social, and political framework shifts, then we must reassess everything, including, here, the prospects for change in the union-Labour relationship. After the defeat at the Bournemouth Labour Party conference of September 2007, which banned political motions to future conferences from unions and local Labour Parties, AWL began to propose a fallback option in addition to our basic line of pushing for the unions to fight within the Labour structures. We argued that politically dissenting unions (some affiliated, some disaffiliated) should regroup, creating in the political field something like (in the industrial field) the Congress of Industrial Organisations which organised the mass unionisation in the USA in the mid-1930s. Over the last dozen years AWL has argued for activists to fight in the unions for those unions to raise the banner of revolt against New Labour, rally those who could be rallied to recreate the old, relatively open, Labour structures that Blair and Brown cemented over - and hive off the New Labour element. In fact over those dozen years things have moved on a more or less straight track towards ever-greater sealing-off of the New Labour machine from the unions and from any species of working-class activism.